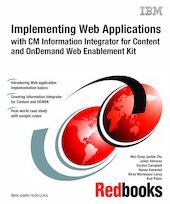 In this IBM Redbooks publication, we deal with implementing Web applications using IBM DB2 Content Manager Information Integrator for Content Version 8 and IBM DB2 Content Manager OnDemand Web Enablement Kit. It is aimed at designers and developers of Content Manager systems. In Part 1, we provide a brief introduction to Content Manager, OnDemand, Web application basics, and the case study we use throughout the entire book when showing and demonstrating how to develop Web applications. In Part 2, we work specifically with application development with Information Integrator for Content. We provide a brief programming overview and show you how to get a quick start with developing Web applications using the Java OO APIs. Using non-visual Java beans, we show you how to build a generic Content Manager application. Working with the case study, we also show you how to build a customized Content Manager application. Lastly, we show you how you can add text search and document rendering in your application. In Part 3, we work with ODWEK. We provide a brief overview of Web enabling OnDemand, installing and configuring of ODWEK, and developing a Web application using ODWEK. There are many sample codes provided along with this book. They provide the basic concept and code for developing Content Manager and OnDemand Web applications.